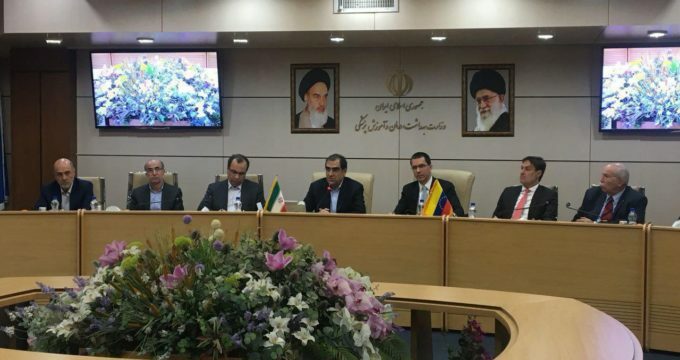 IRNA – A comprehensive memorandum of understanding (MoU) on cooperation between Iran and Venezuela in the field of pharmaceuticals was signed in a ceremony attended by Iran’s minister of health, treatment and medical education and Venezuelan foreign minister. The MoU, signed here on Saturday, underlined strengthening mutual cooperation on export of medicine to Venezuela and producing and registering Iranian medicines as well as holding specialized educational courses in the country. Iran’s Health Minister Hassan Qazizadeh-Hashemi said in a meeting with Venezuelan Foreign Minister Jorge Arreaza Montserrat that Iran’s capabilities in the field of medicine, health, and treatment services as well as producing pharmaceuticals are known in the region and it has ranked first in the field for years. Despite sanctions for 35 years, Iran has managed to achieve remarkable progresses in various fields such as medicine, Hashemi said. He also proposed holding of an exhibition featuring Iran’s capabilities in the fields of health and medicine in Caracas, hoping that Iran would be able to help Venezuela produce medicines, vaccines and medical equipment.